The West and Russia can’t seem to get over their differences, with the tensions between the Washington and Kremlin changing the stakes for the whole world. How far would this confrontation go? Is there another Cold War coming? And finally, will the world once again know the horror of a Nuclear War looming over the humanity? We ask these questions to a prominent American scholar on Russian studies, Professor at New York University and Princeton University. 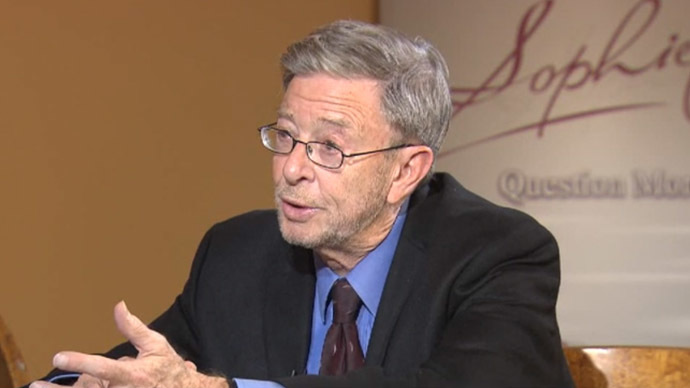 Stephen Cohen is on Sophie&Co today. Sophie Shevardnadze: Stephen, it’s really great to have you back and to have you on our show once again. Now, you’ve called the current U.S.-Russia crisis “the most dangerous confrontation in many decades” - are we close to a war? Stephen Cohen:Let me tell you what I think happened. We are in a new Cold War. In America, the policy-makers say it’s not a Cold War, because they don’t want to take a responsibility for it, because their policies, and not just recently, since the 99s, have led to Cold War. It began before, I think, the Ukrainian crisis, but what happened in Ukraine, is that about a year ago, in November 2013, there was a political dispute in Kiev, about whether Yanukovych will sign the agreement with the EU. That political dispute, after the coup in February became a Ukrainian Civil War, generally speaking between Kiev and the South-East of Ukraine. The Civil War then became what we call a “proxy war”, with the U.S. and NATO supporting Kiev and Moscow supporting the eastern Ukrainian rebels. The danger is, and I think it continues even now, though some people think the ceasefire has averted the danger, but the ceasefire is not solid, we don’t know if it’s going to be here tomorrow or next week...the danger is that the proxy war would lead by accident or intention to the intervention of Russian military forces in the East and NATO forces in the West, and that would be the Cuban Missile Crisis. SS: That’s what I was going to ask you - is there really a realistic scenario in your head where U.S. and Russia could actually enter into direct military confrontation? SC: Yes. I just explained it to you. If the war, the Civil war in Ukraine begins again, the military aspect of it, if the ceasefire fails, if, let’s say, Kiev attacks the Donbas again...if Russia feels the need to help the Donbas militarily - it is being discussed in NATO, the possibility of NATO forces entering Western Ukraine. Now, what would that mean? You would have the America-led NATO forces in Western Ukraine, whether on the ground or in the air, it doesn’t matter, Russian forces in the air or on the ground - and that would be a modern version of the Cuban Missile Crisis. Now, I notice you’re smiling, like I’ve said something fantastic, but we have to think the unthinkable, because who knew 2 years ago we were going to be in a completely…. SS: Well the unthinkable is nuclear weapons being involved - do you think that’s a possibility as well? SC: Well, let’s look at what’s happened. Russia has the doctrine; they’ve had it since the 99s, because Russian conventional forces are weaker than American-NATO conventional forces. Russia reserves the right to use nuclear weapons if Western conventional forces threaten the Russian state and Russia. Meanwhile, as was announced in the New York Times on the front-page, maybe 2 weeks ago, I forgot, that President Obama is about to sign a budgetary decree of what he calls a “major modernization” of our nuclear arsenal at the cost of $1 trln over 30 years. One trillion dollars is only the cost today, it doesn’t include overrun inflation, and it’s a fortune. Meanwhile, your government has been, quote, “modernizing its nuclear weapons” - but let’s talk as adults, what does the word “modernization” means? It means buildup, so both sides are now building up their nuclear weapons, we’re in a new Cold War, we’re beginning a new nuclear arms race, and the danger is now immense - does that mean there’s going to be war? No. The problem is to avert war you need leadership, political leadership, and the question of who’s leading correctly and who’s not is a political discussion, but the danger is there, absolutely 100%. SS: There is another huge problem: between the two are the sanctions, the imposed sanctions. Now, Moscow insists that it did not help to push for a ceasefire over the situation in Ukraine in Minsk to actually stop the sanctions, but it helped it, because restoring peace in Ukraine is much more important for Russia. Then you have the West that’s always tying sanctions to the agreement made in Minsk over Ukraine. SS: Do you think he will be doing this? Because, like you’ve said, it would take forever to actually undo that afterwards? SC: That’s correct. Will Obama veto it? We don’t know if it will get to Obama, it’s got to go out of committee , then it’s got to go to the full Senate, then it’s got to get a majority, and then it’s got to go to Obama, I don’t know. We’re not sure what Obama does from day-to-day, I mean, if he changes his mind... Now, if the Ukrainian Civil War begins again, if Kiev and the South-East begin fighting and shooting and shelling and what else, now, then I think Obama would sign it. But if the ceasefire and negotiations are unfolding - I don’t think Obama would actually sign this. But the strange thing is, it needs to be explained, but I’m not sure I can completely, is why were new sanctions brought against Russia just as Putin and Poroshenko agree on a ceasefire and negotiations? SC: That’s right. They agreed in Minsk, Poroshenko and Putin, and the others, the Ukrainians, and the EU, that there would be a ceasefire and negotiations both about trade, but also about the new Ukraine, if there’s going to be one. And suddenly, these sanctions were imposed. I think - I can’t prove it – that this was a compromise between Chancellor Merkel and Germany, who has a softer approach towards Russia, wants to end this and get back to business as usual - and the war parties in NATO and Washington; and there was a compromise agreement, where the sanctions were something that Merkel agreed to in return for something she got. SS: I’m sure you’ve heard about American vice-president speech at Harvard University, where he revealed that American leadership actually had to embarrass the EU into imposing sanctions on Russia over Ukraine. To me, it seemed like it came as surprise for the EU - do you think EU is really willing to hurt itself because America wants it to? SC: I don’t think, Sophie, that we can talk on these terms of singular entities. There are factions, there are groups. Roughly speaking, it’s not entirely precise, there’s a “war-party” in Washington, there’s a “war-party” in NATO, in the EU, there’s a “war-party” in Kiev, because Poroshenko is under attack in Kiev, because of the ceasefire, and - please, forgive me - there’s a “war-party” in Moscow that feels that Putin should not have agreed to the ceasefire, that the rebels should have gone on and taken Mariupol, maybe Odessa and that he gave up too much in agreeing to end the fighting and so forth . So, you’ve got forces in Washington, Kiev, Europe and Moscow who want more war. Now, Merkel leads, in my analysis, the party that doesn’t want more war, it wants this war ended, wants to get rid of it, wants to have some negotiations, and wants to EU end the sanctions or at least resume normal trade. SS: Business as usual, yeah. SC: Well, because… look, what is sanctions? We think we’re punishing Russia - and we are, it’s going to hurt Russia, there’s no question; but look what’s happening in Europe - European economy is down, Italian and French farmers are furious at their governments and the EU, because the Russian market is closed to them, there’s too much whatever they produce - cheese, grapes, oranges, bananas - I don’t know - but 40% of those goes to Russia and suddenly there’s no Russian market. That means they have to cut their prices in Europe, there’s too much supply, too low demand, they can’t meet their costs, these people going to go out of business. Sanctions cut both ways. SS: You’ve also said that the whole Ukrainian thing has split Europe into two. SS: Or three - so how are working out a single policy to actually patch things up? SC: They aren’t! You hear different voices...look, Merkel went, about a month ago or so, I forget, in August, I think to Kiev, and after talking to Poroshenko stands before the press and says “the war must end, there’s no military solution, and there must be ceasefire negotiations.” Poroshenko says: “I agree.” Then Poroshenko comes to Washington couple of weeks ago, addresses Congress, and says “We must fight, give us weapons, we’re fighting for democracy, we must defeat Russia”. He’s speaking out of both sides of his mouth because there’s conflict in the West, and he’s trying to play the middle game. SC: What we do know is this: there’s been fighting for the Donetsk airport that never stopped, and suddenly it appears that Kiev shelled Donetsk and it did that on the day that school began, they shelled some schools. It’s horrible...think of what’s happened; let’s open our minds to the tragedy. In November 2013 the EU told Yanukovich, then the President of Ukraine: “sign an agreement with us or go to Russia”, and Putin said “why do they have to choose, let’s have a three-way agreement of trade and financial aid to Kiev” - you remember that, it was very clear. Lavrov, Russian foreign office and everybody… and Europe said “No” and Washington said “No, we can’t do that”. Now, what’s happened: near a year later, they ask Putin “please come to Minsk and discuss with Poroshenko Russia, Ukraine and Europe, the three-way deal.” Four thousand people have died, one million people have been turned into refugees, the Donbas has been destroyed for the agreement that could have happened without one shot fired in November one year ago. Who’s responsible for that? Historians will look back and ask, “Who is responsible for the deaths of those people, that destruction, those refugees, when the outcome was available in November 2013, with a little diplomacy.” That is a collapse of diplomacy. Why did the West exclude Russia from the negotiations in November, that’s the question. Do you know the reason why? What would think? SS: What would you tell me? SC: I think it was about NATO expansion, that trade agreement. SS: Obviously, that’s another huge topic, because many believe that NATO expansion is the main stumbling point between Russia and the West. Also, NATO strategy to actually move Ukraine out of Russia’s orbit - it is a huge problem, for Russia. Should Russia consider NATO’s actions in Europe as a threat? SC: If I found out where you live and I came to your house, and I’ve sat out in front of your house with a lot of weapons, and I’ve said to you: “Sophie, I’m not here to harm you, this is good for you, this is security” – you’d be frightened and buy a few guns to protect yourself, obviously. Look, when NATO expansion began in 1990s, the late George F. Kennan, who was considered the wisest man in America about American-Russian relations, said “This is a terrible, reckless, stupid decision” and it will lead to a new Cold War. Twenty years later, George - I call him George, because we both were in Princeton together, we saw each other regularly - was correct, and he was not alone. I’ve said it, Jack Matlock who was Reagan’s ambassador to the Soviet Union and Gorbachev… A lot of people warned that the expansion of NATO eastward was going to lead to a very bad situation. SS: But was the expansion a deliberate idea, maybe, a deliberate act, with an eventual stand-off with Russia in mind? SC: How can you expand a military alliance without a deliberate decision? It wasn’t as if nobody was paying attention, and NATO was on wheels and just kind of drifted…Major decision was taken under Clinton to do it, and it was a catastrophically unwise decision, and not only because it led to conflict with Russia, but what it said to all these new countries in NATO that were part of the Soviet Block is that you don’t have to have normal diplomatic relations with Russia, that the Baltics don’t have to negotiate with Russia about the rights of Russian-speaking people there. You don’t have to negotiate.. Georgia, who thought it was going to get into NATO one time - you don’t have to negotiate, you can punch Russia in the nose and hide behind NATO. How much diplomacy is going on? Very little. That was one of the bad things about NATO expansion, it was the end of diplomacy between Eastern Europe and Russia. The expansion of NATO was done for one main purpose - to increase security in Europe. It did just the opposite. SC: That’s an ideology, that’s not a reality. I mean, it’s foolish, everybody else knows it isn’t true. Russia is preparing for war, as NATO moves closer to Russia. And, by the way, remember something very important, which is often forgotten: missile defense. Russia’s tried to compromise on where this missile defense would be located. Russia has proposed it to be joined, Russian-American. What did the U.S. do? They gave the missile defense project to NATO, so missile defense is now part of the NATO expansion. It’s not just NATO bases coming towards Russia, it’s the missile defense. Now, U.S. says the missile defense is not directed at Russia, but American scientists have said, in its fourth stage it will be able to strike down Russian missiles as the rise towards their ultimate trajectory. Now, that means that Russia will not have the deterrent and the nuclear peace that had been kept for 45 years, on this crazy theory - but it has worked until now - that we won’t attack you because we know if we attack you, you will attack us and vice versa - missile defense could end that. SS: Also, just recently, the U.S. has shipped tanks, soldiers, armored vehicles to the Baltic states - I mean, it’s the first time since the end of the Cold War, that U.S. has shipped armed vehicles into Europe. What threat is that aimed at? SC: Look, this is driven by the Ukrainian crisis. There’s a theory in the West of what the meaning of Ukrainian crisis is - that the Ukrainian crisis was started by Putin - that isn’t true, but that’s believed, that’s the ideology - and the Ukrainian crisis is only the beginning, that Russia, the Kremlin, Putin, Russian imperialism is going to move on to the Baltics, to Poland. It’s all ridiculous, there’s no evidence for it. But, there’s been a group in NATO that for at least 15 years - you remember, there was an agreement between NATO and Moscow, that even if NATO would expand, there would be no NATO permanent military bases in these countries that came in closer to Russia - but there’s been a group in NATO for years who wanted to do that, they’ve seized the Ukrainian crisis at the NATO Wales summit, month ago, to create this so-called rapid deployment force of 4,000 men. What good are 4 thousand man against the Russian army? Zero, but there’s a reason: there going to go bases, communication centers, barracks, air strips in Poland, in three Baltic countries, maybe in Romania - Romania hasn’t quite agreed - and that would be not only NATO expansion politically, which is what it was previously, and now it’s an actual military expansion. In addition, there is a plan, as you know, to build land-based missile defense installations in Poland and in those countries, so you’re right, for the first time there’s a military expansion of NATO, not just political, towards Russia - but it’s not too late to stop it. It’s not too late, if leadership does what leadership is supposed to do, if statesmen and women do what they are supposed to do - we can end this Ukrainian crisis and stop this military expansion of NATO, it’s not too late, but it’s five minutes to midnight. SS: How hard is it for you to get your point across the American public when it comes to mainstream media, because, you know, you’re always welcome here, at RT, but do you get a platform where you can talk and do you think you’re getting your point across? SC: Let me say a word about RT. Some people say if you go on RT it’s unpatriotic - it’s complete nonsense. It’s just that they don’t want to have a debate. In the U.S., I’m not alone, there’s a very famous American professor John Mearsheimer in Chicago, who has published a big article in the most important American journal of the elite, “Foreign Affairs” with the title of which is something like “America caused the Ukrainian crisis” - it was a sensation. I’ve been arguing that for several months, I was very happy that professor Mearsheimer joined this debate. Jack Matlock, you remember who he is? SS: Yeah, I’ve actually interviewed him recently. SS: The New York times actually called you “dissenting villain” because of your views on Russia. SC: When I was a kid, there was a saying “sticks and bones will break my bones, but names will never hurt me” - but names do hurt you, because they stigmatize you, they make people not invite you on mainstream television. The problem is that the Washington elite depends primarily on mainstream television and on the three newspapers: The New York Times, Washington Post and Wall Street Journal. Our point of view never, since last February, when the crisis began, has appeared on their opinion pages, never. We’ve been excluded. Jack Matlock hasn’t been there, professor Mearsheimer hasn’t been there, my articles have been rejected. I’ve never seen this before in America, this is something very strange to me, because newspapers used to like controversy, but on this issue, they seem to have convinced themselves there’s only one point of view. SS: Alright, you’ve got about 90 seconds. Tell me, how does the situation affect the policy-making, decision-making, in the White House. Do you feel there’s lack of expertise on Russia? SC: Yes. We don’t even know who advises Obama. In the past, we always knew to whom the President listens, even if those people were not in the government. But we know, for example, that probably among the wisest men about Russia today in the U.S. is Henry Kissinger. He’s 92 years old - Obama hasn’t talked to him. SS: He has also actually said that demonizing Putin is not a policy. SC: “It’s an alibi for not having a policy.” I think it’s worse; it’s an alibi for having a bad policy. I’ll tell you what we do: I’m old, I’ve been through this before, I went through this in 70s… those of us who think as I do, we keep speaking out when we can, we’re organizing, we try to talk to Senators and Congress people who are willing to listen to us. The problem is, most of them are Democrats and they don’t want to come out against Obama, because there are Congressional elections coming in November. They don’t want to do anything to be critical of Obama publicly, because the Democrats are having a hard time holding the Senate and the House. This is not about Russia, this is about our social welfare programs, our Supreme Court, about helping poor people, about social justice in America - it’s a very important issue, I don’t fault them. But, what I say to them: “Ok, after the elections I expect to see you on TV saying this Ukrainian crisis is a disaster and we are also guilty, not just Russia”. We’ll see if they say anything. What else can you do? SS: Thank you very much, Stephen Cohen, very famous American scholar on Russian studies, thanks a lot for this interview.